Liebert PDX Compact DX Cooling System, 11-29kW, direct expansion cooling system offers the industry’s highest efficiency, protection and capacity per footprint for server room cooling. network closets and other small spaces. Liebert PDX compact perimeter cooling solutions let you achieve the highest efficiency and protection with low capital, installation and maintenance costs. The Liebert PDX is highly configurable and available in a wide range of capacities. Available cooling types available include Air; Water/Glycol; Dual Cooling (Water/ Glycol Cooled + Econ-O-Coil), providing full and partial free cooling; Dual Cooling (Chilled Water + Air-Cooled Refrigeration), providing full and partial free cooling; and GLYCOOL™ (Fluid-cooled Economizer and DX Refrigeration System). The units feature variable speed EC fans that reduce motor energy usage up to 80%, compared to standard AC motors, and are more efficient than centrifugal blowers even when operating at 100% fan speed. 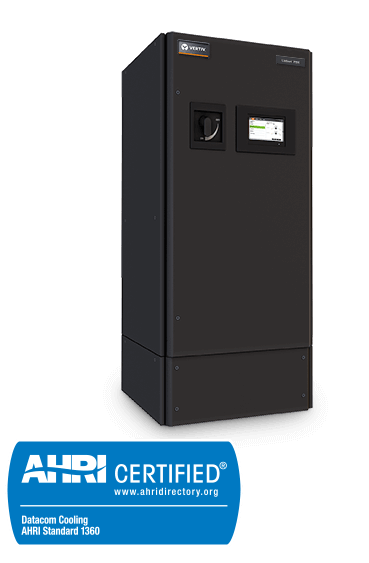 The digital scroll compressor in the Liebert PDX uses R-410A refrigerant. Condensers on the water/glycol cooled, dual-cooling, and GLYCOOL systems feature motorized control valves, managed by the Liebert iCOM controls. These valves control the water or water/glycol flow and maintain the desired condensing temperature for various entering fluid temperatures. The Liebert PDX offers unique, floor-level air discharge that reduces the mixing of hot and cold air to improve efficiency. Downflow models provide front, left side and right side discharge and upflow models provide front and rear return options.